"19 oval cut blue-violet tanzanites, skillfully set in east-west orientation, adorn this bracelet totaling 9.52 carats, measuring 6x4mm. The gem source is near the foothills of Mt. Kilimanjaro in Tanzania; the suite is perfectly matched in size, vivid blue-violet, transparency, and luster. They are complemented by 266 scintillating round brilliant cut diamonds, prong set, around each tanzanite in dazzling halo clusters totaling 3.00 carats. 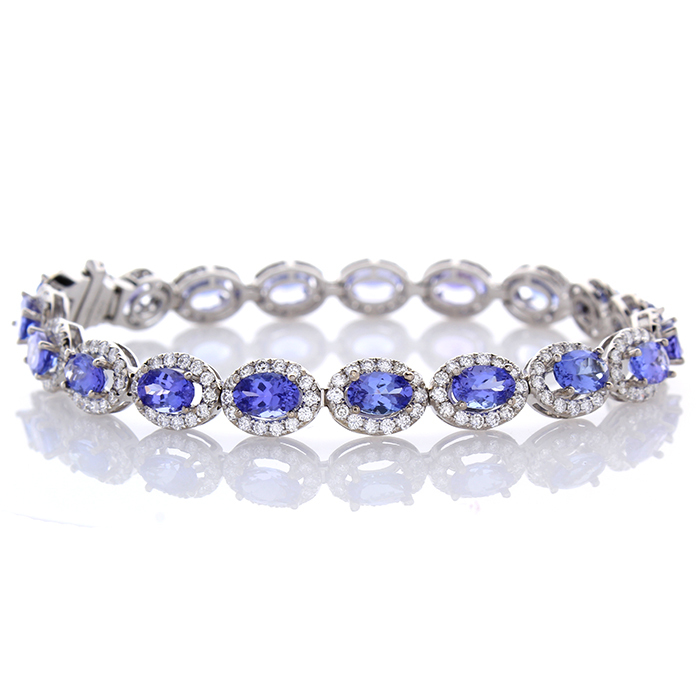 Designed in brightly polished 18 K white gold, this tanzanite and diamond tennis bracelet is held together by a hidden slide clasp and safety latch.